The research system in Galaxial has undergone many redesigns over the summer and has turned out quite different to what I originally had planned. The user interface still needs some work but is now mostly finished. Once you have enough research data it can be spent on projects to instantly 'unlock' them. Rather than choosing what to research and then having to wait for it to be completed. The reason I choose to do it this way is because the research data already takes a long time to accumulate and will also be required for building really advanced ships and modules. The technologies shown in brown are unique to the faction you are playing and will generally provide strong bonuses. The same basic technologies, ships and modules will be available to all factions but there will be a lot of faction unique stuff that is more specialized and will allow different play styles and strategies. I am still undecided on how many levels to have for each research project. I would like for there to be no limit (unlimited research) possibly with diminishing returns the more you research a technology, but this could potentially lead to a lot of balancing issues. Maybe its not a problem? For example if the player becomes too powerful then all other empires could become afraid and form a coalition against you. A resources bar has been added along the top of the screen to show your empires total resource stockpile. 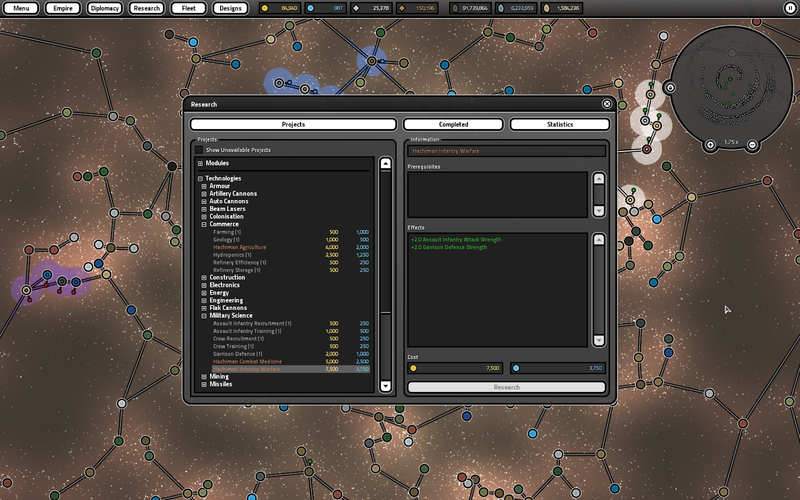 The resources are (from left to right): Credits, Research Data, Crew, Troops, Common Metals, Rare Metals and Precious Metals. Crew and Troops are a recent addition and I will explain how they work in a future development log as they are not quite finished yet. Ore mined from asteroids require transporting to colonies that have refinery facilities and after being processed into metals they are then added to the resource stockpile. 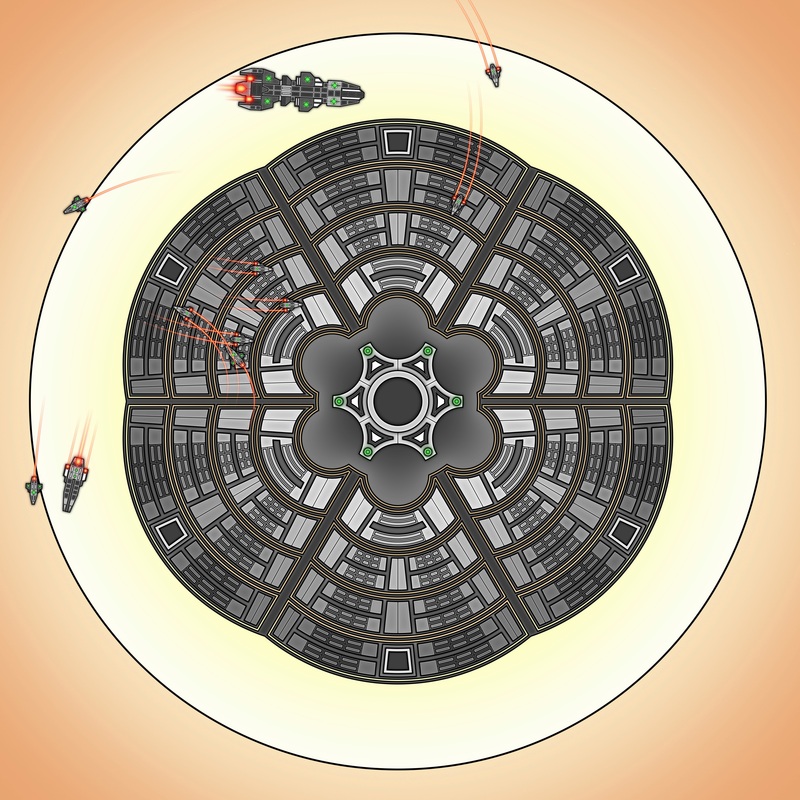 Graphics for the colony populations have been improved slightly again to match the same style used for the ships. Facilities such as shipyards, refineries, hydroponics will be constructed at the empty inner circles. New graphics for those haven't been created yet. 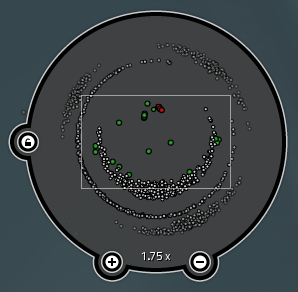 Added a button to lock the minimap viewing position so you can keep an eye on two locations at once. You wont have to rely on just this as there will eventually be some kind of message/alert system for when important events happen. Most of the user interface windows/widgets in the game look much cleaner now after removing a lot of the inner white outlines and added some subtle gradients. 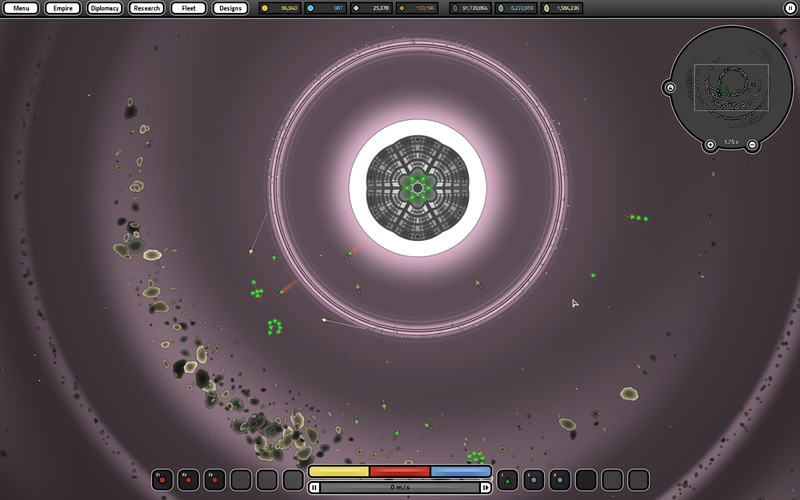 Galaxial is proving to be an enormous game to develop solo! Thanks again for your patience and I hope you will really enjoy it when you finally get to play.